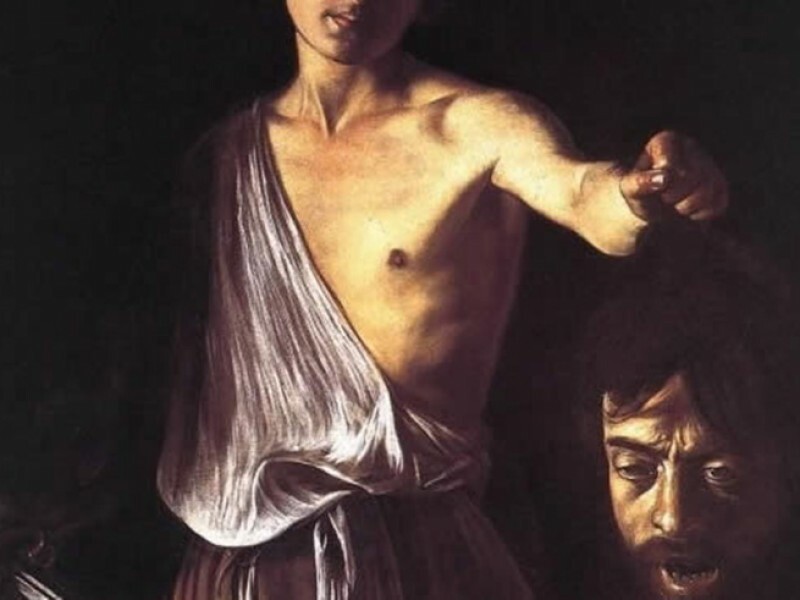 If you like your art gut-wrenchingly dramatic and unbearably tense, then you need to get acquainted with Caravaggio. A manic, violent genius, his incredible works caused a sensation in Rome at the end of the 16th century, dramatically ushering in the age of the Baroque. 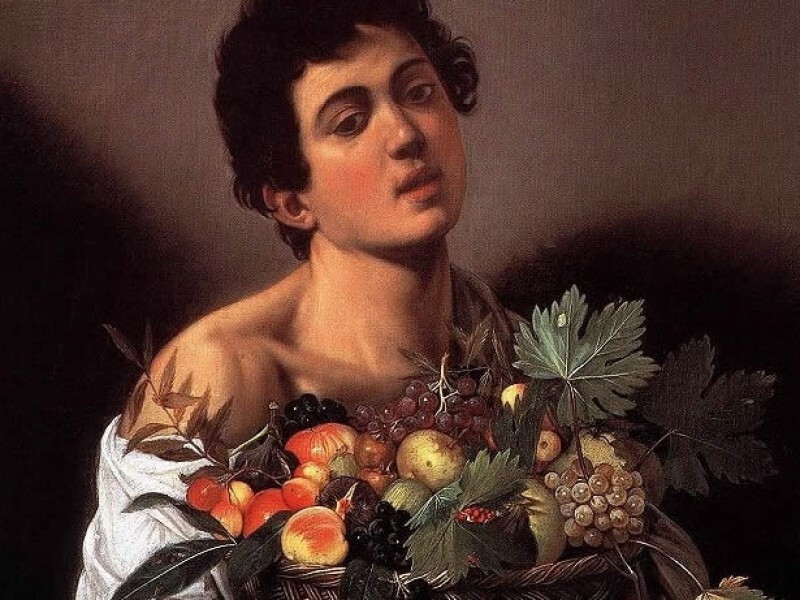 The world of Caravaggio is a world of sensory overload – a rich tapestry of saints with dirty feet being lead to martyrdom and sensual Virgins, of voluptuous angels and provocative nudes. His works vividly capture the sights and smells of Baroque Rome like no other, splendid and squalid in equal measure. 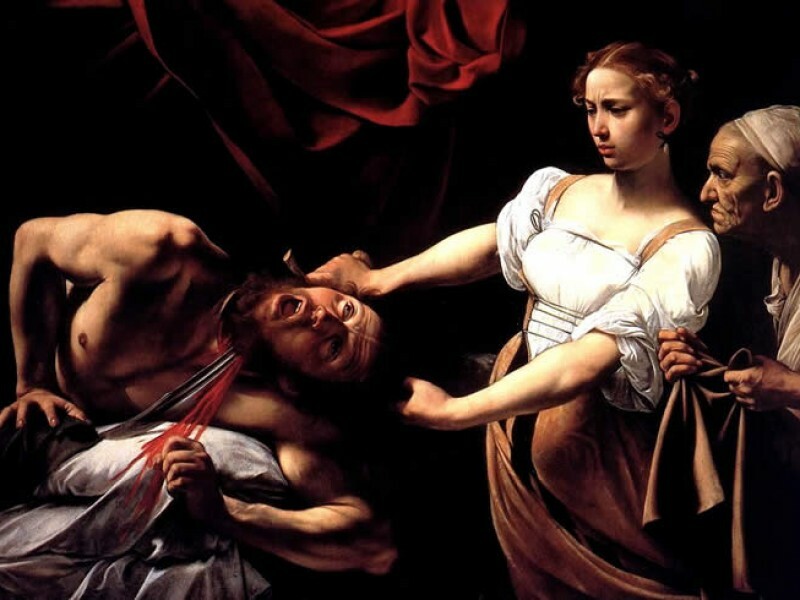 Our unique Caravaggio in Rome tour itinerary has been specially designed to give you an unparalleled insight into the mind and masterpieces of the art world’s most controversial genius. Join us as we weave our way through the cobbled streets of the Eternal City and visit four beautiful off-the-beaten-path locations that are home to some of Caravaggio’s greatest Roman masterpieces – the majestic but often overlooked Baroque art gallery Palazzo Doria Pamphili, and the churches of Santa Maria del Popolo, Sant’Agostino and San Luigi dei Francesi. 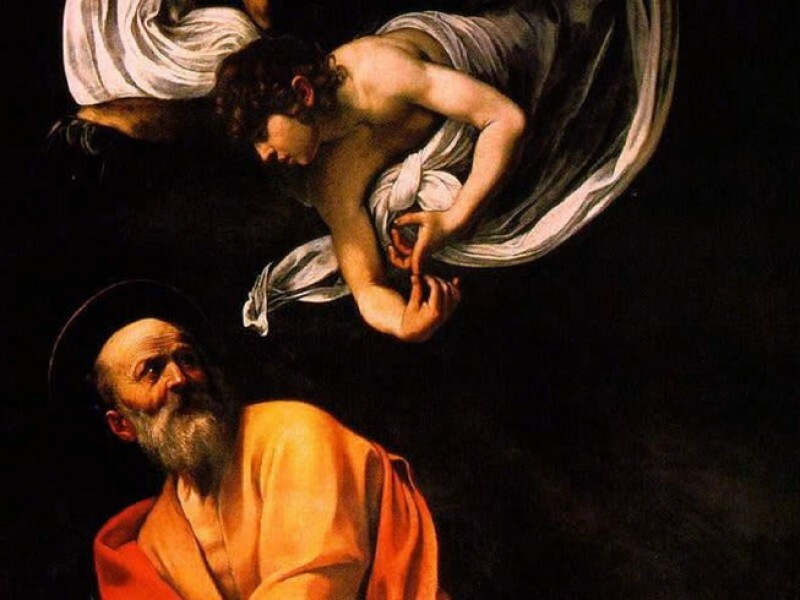 On our tour you’ll learn why Caravaggio’s incredibly innovative pictorial language changed the world of art forever, from the powerfully realistic stripped down visions of conversion and death in Santa Maria del Popolo’s Martyrdom of Saint Peter and Conversion of St. Paul to the swirling chiaroscuro drama of light and dark in San Luigi dei Francesi’s Martyrdom of Saint Matthew. Caravaggio’s vision of a religious art peopled by ordinary folk – peasants smeared with grime, street-walking prostitutes and lumbering old men – was as controversial as it was revolutionary, and perfectly encapsulates the contradictory spirit of the Baroque age. Just as exciting as Caravaggio’s innovative canvases are the dramatic stories behind them. One of our expert art historian guides will make these masterpieces come alive by revealing the dark psyche and tumultuous life of their creator - the arrogant Caravaggio’s was in constant trouble with the law, and his simmering violent temperament exploded when he murdered an obscure rival in 1606. After a decade in exile being hunted by assassins, the greatest painter of his age died in penury desperately trying to make his way back to the city that had made him famous. This is Rome at its most exciting – join us on a journey to discover it through the timeless masterpieces of Caravaggio. The long history of Rome has been chequered by characters full of controversy and brilliance, and no-one has encapsulated this confounding mix of the high culture and low morals more than Caravaggio, one of the most famous painters in the story of Italian art. Extraordinarily prolific, despite his tragically early death and his long flight from the law, Caravaggio's startlingly original work changed the landscape of art forever. Join us as we uncover his dramatic life of violence and intrigue through the prism of the artistic legacy that he left to the Eternal City. 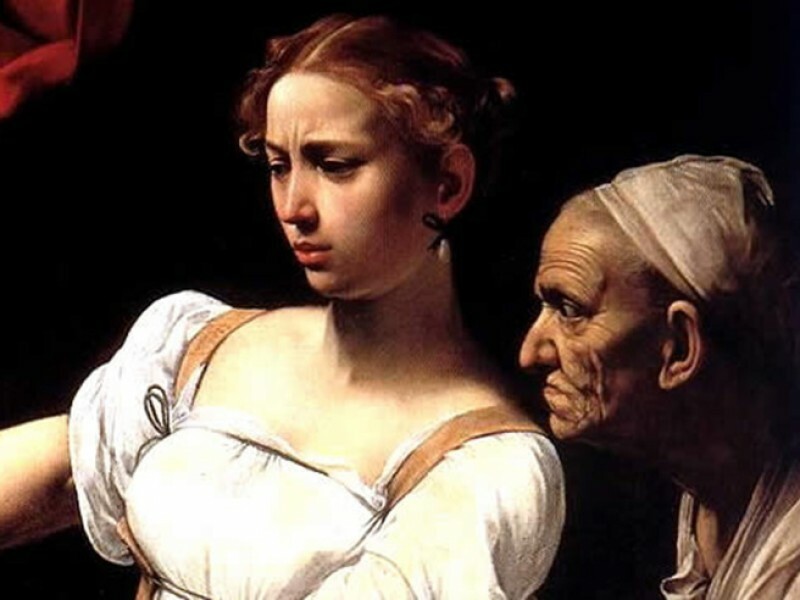 On this Rome Caravaggio Tour we’ll retrace his steps through taverns and brothels, palaces and churches, and discover how the troubled life and art of this great genius have remained inextricably linked in the popular imagination of the city. 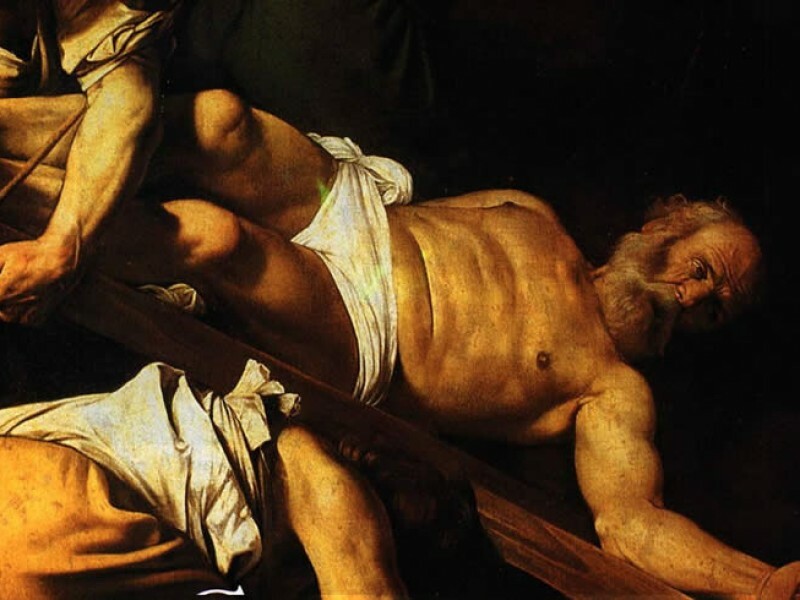 The ancient church of Santa Maria del Popolo hides two of Caravaggio's greatest masterpieces, The Conversion of Paul and The Crucifixion of St. Peter. In these stark expressions of Caravaggio's unique brilliance, guileless figures loom out of the darkness at us, disconcertingly close and unexpectedly large. These are no idealized exemplars of classical beauty, but men with dirty feet and faces marked by their wearisome work. 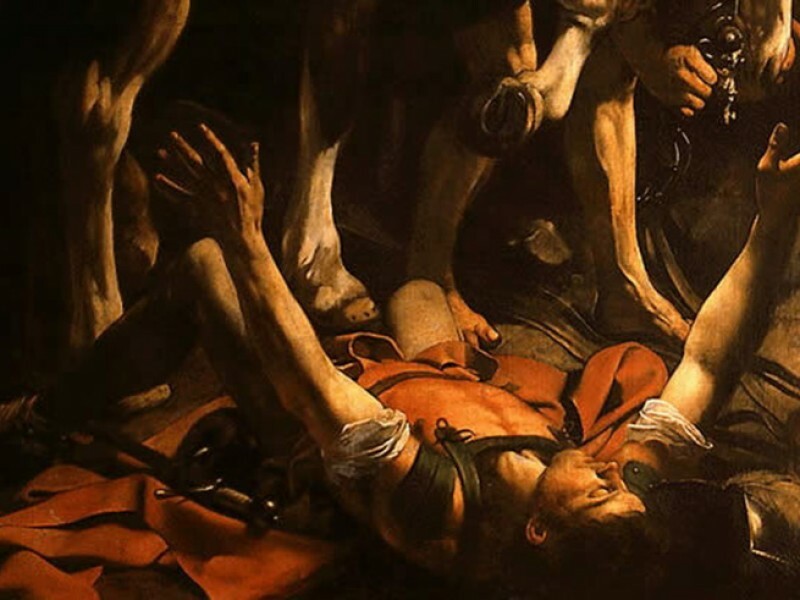 In The Conversion of Paul, Caravaggio turns centuries of conventional wisdom concerning composition and symmetry upside down - his canvas is dominated not by the moment of divine revelation but instead by the huge and inelegant flank of a draft horse. The contrast with the classical serenity of Annibale Carracci’s altarpiece could hardly be more obvious, as two visions of the future of art vie for the ascendancy in the space of this tiny chapel. It was the vision of Caravaggio that would win the day. These rough and unadorned canvasses of real people thrust into the world of biblical narrative constituted nothing less than a revolution in religious art, and painting would never be the same again. Caravaggio's disturbing tendency to mix the sacred and the profane surfaced once again in the church of Sant'Agostino, not far from Piazza Navona. The Madonna of Loreto that he painted for the Cavaletti Chapel is a wonderful work of introspection and quiet devotion, but the pilgrims' dirty feet, the Virgin Mary's barefooted apparition and the general urban decay in which the scene is set worryingly brought the impoverished and lowly streets of Rome into the rarefied air of the church. Was this the appropriate reflection of a new religious populism, or a wildly inappropriate secularization of the mysteries of the faith? In the company of your expert guide, learn how Caravaggio's idiosyncratic approach to sacred imagery divided the art scene of the 17th-century city. Few cities in the world are blessed with as many historical palaces as Rome, vivid reminders of its glorious past. Palazzo Doria Pamphili might be the most spectacular of them all. The enormous palace is situated right in the heart of the city on Via del Corso, and unfolds through elegant halls and salons where gold glitters off every surface. In Caravaggio’s day the Pamphili were amongst Rome’s most powerful families, and their fame rose to its highest when Giovanni Battista Pamphilj was made pope in 1644. In their suitably lavish pad in central Rome the family set about assembling one of the world’s greatest collections of Baroque art, including works by Tintoretto, Carracci, Titian, Velazquez and Bernini. These days part of the family pile is given over to a splendid art gallery - incredibly, the Doria Pamphili family still live in a wing of the massive palace, and strolling through its gilded halls today gives a unique insight into the luxurious world of Rome’s Baroque aristocrats. In these rarefied surroundings we’ll get to admire three of Caravaggio’s earliest masterpieces – the courtly Rest on the Flight Into Egypt, where an angel serenades the Holy Family with a Renaissance madrigal on a violin, the pensive Penitent Magdalene surrounded by her abandoned finery, and a provocative young St. John the Baptist embracing a ram. 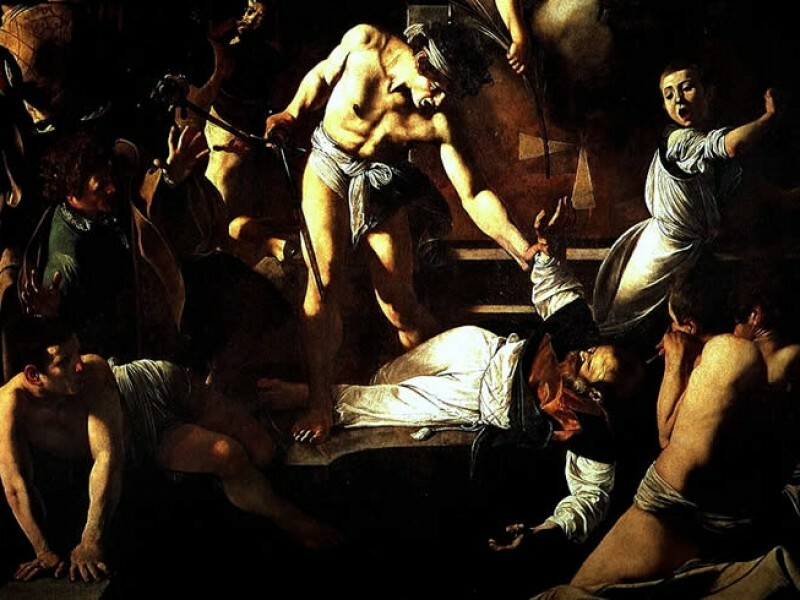 In the beautiful church of San Luigi dei Francesi, home to Rome’s French community for more than 500 years, we’ll be confronted with one of Caravaggio’s most famous evocations of violence, the electrically tense Martyrdom of Saint Matthew. A scantily clad youth apparently awaiting baptism has risen up from the crowd of the faithful, sword in hand, and is poised to dispatch the unsuspecting saint. An altar-boy flees in panic as a motley crowd looks grimly on, powerless to intervene. The painting is extremely dark, with snatches of light brilliantly illuminating faces amongst the shadows. This is a perfect example of Caravaggio’s innovative chiaroscuro technique, which lends his paintings their unique air of drama and foreboding. Amongst the whirling vortex of confused figures, a bearded man in the shadows catches our eye. This is a portrait of none other than Caravaggio himself, at once repulsed and yet beguiled by the terrible power of violence. Facing the Martyrdom of Saint Matthew in the Contarelli Chapel is another of Caravaggio’s greatest works – the Calling of Saint Matthew. Here Jesus calls the aging Matthew into his service, and as ever light is the real star of the show: the canvas is split in two by a blinding shaft of sunlight, symbolising the light of God illuminating the money-lender turned apostle’s consciousness. In 1606, when Caravaggio was at the height of his fame after so many transcendent successes, the artist's volcanic temper finally brought about his downfall. During a duel on one of the city's many tennis courts, Caravaggio fatally stabbed his rival, the otherwise obscure Ranuccio Tomassoni. 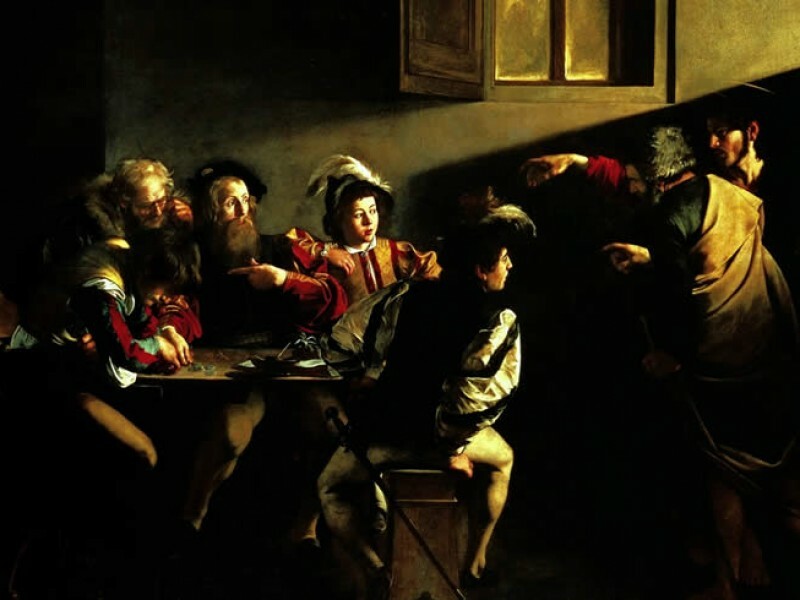 The details remain shrouded in mystery – perhaps the argument arose over unpaid gambling debts, or competing affections for a young woman, but whatever the cause, at a stroke Caravaggio became persona non grata. The moody violence that seemed to grow more forceful in every passing work that he painted had erupted from the world of pictorial fantasy and into reality. With the ill-considered thrust of his sword, Caravaggio lost everything. From the most famous painter in Rome, a man feted by cardinals and aristocrats, Caravaggio was reduced to an exiled fugitive, fleeing justice and pursued by unknown assassins out for revenge. Caravaggio would never again return to Rome. The sins of his past never left him in peace, and the great artist was destined to die feverish and alone on the beach of Porto Ercole in the blinding light of an Italian morning. Fashioning works of sublime beauty from the inky blackness of his imagination, Caravaggio had invented a new language of pictorial drama that was all his own, a chilling world of executions, assassinations and martyrdoms. Those dark fantasies overtook him, and with a tragic inevitability became his own reality. Obsessed with his own work, he had become a part of it. Discover the fascinating life and works of one of the true giants of Italian art on our special Rome Caravaggio tour. Your guide will meet you at your hotel if it is located in the city centre near the tour itinerary. Otherwise we will chose a meeting point closer to the sites in order to save you time. This is a tour through the city center of Rome, including a museum and some churches. There are some steps. Comfortable shoes and a bottle of water are recommended. Thomas is such a gracious guide. Informative. Patient. And willing to uncover the unexpected. We really enjoyed our time with him,. We loved the Caravaggio tour! It was so nice spending the afternoon with Frederica who shared a wealth of knowledge about the painter along with a lot of other information, as well. We enjoyed walking to the various locations to see great works of art and hearing some personal information about the artist, as well. Frederica has inspired me to learn more! It was lots of fun and so interesting. We were sad for the tour to end! Thanks so much, Debbie Klein P.S. We really enjoyed all of our tours with Through Eternity. Guia, Enrica and Frederica were all lovely, informative and enjoyable to be with. I would recommend them all! We fell in love with Rome. It was a great trip! Thanks again!